Lee Sommers Strength Coach - Register for a clinic today! Strength & Conditioning Coach for Nations Capital Swim Club and Rockville Municipal Swim Club. 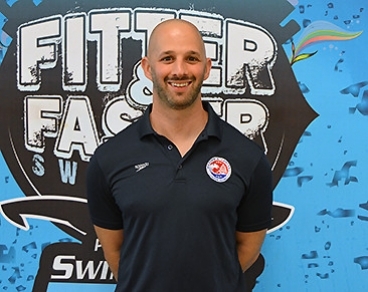 The Fitter and Faster Swim Tour doesn’t just allow young athletes to learn directly from elite athletes – it also allows swimmers to improve their agility and strength under the expert eye of athletic trainers. Lee Sommers is one who has helped guide many of our swimming heroes to the Olympic podium as well as developed tools to stay injury-free! When people talk about Katie Ledecky’s technique and athleticism, the name that comes up most often is her coach, Bruce Gemmell. However, another part of her development can be credited to Sommers, the strength and conditioning coach to this Olympic gold medalist and multiple world-record holder. He has been in the fitness industry for the better part of two decades and has spent most of that time as a Director of Fitness in the Washington, D.C. area. In 2013, he began working with members of Nation’s Capital’s National Team, including Ledecky and Carsten Vissering, a competitive breaststroker at the University of Southern California. After several years of working with swimmers, Sommers has garnered vast knowledge about the sport: So much so, that he can walk into a Fitter & Faster clinic and guess correctly as to which stroke an athlete specializes. “I just watch how they move as an athlete,” he says. Though each swimmer’s body differs, Sommers is able to challenge each participant to lay down proper neuronal patterns and connect proper muscular movements into their swim races. Increased body awareness enhances body positioning and proper technical execution of each elements of competitive swimming. Whether your swimmer needs to increase core strength to have the tightest entry on the start or to quickly get their feet to the wall on open turns, Sommers is the man for the job. 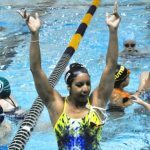 While most fitness and strength programs lack specificity to how a swimmer’s body moves in the water or during races, Sommers has has years of experience learning the ins and outs of a swimmer’s developmental needs. He will work not only with the swimmers but also the coaches to figure out a training plan that works best for their specific needs. What swimmer doesn’t want to swim faster with stronger, injury-free bodies? Register for Sommers’ next clinic today!